What Are Paddle Boards Made Of? There are a variety of materials used to make a paddle board. You can own either an inflatable paddle board or a solid one. Manufacturers use the same material for inflatable boards, but many different types of material for solid ones. If you’re not sure what is what, then this guide will help you. We will examine the four types of paddle board materials, and how they differ between each other. Portability: Being able to transport your paddle board from your home to the water can be challenging. Portability looks at minimal weight, storage capacity, and convenience of transporting. For example, solid boards will need a car rack, dolly, and/or strap sling to transport. Affordability: Not everyone wants to spend $1,000 on a board. Affordability looks at the price of the board, how much it costs to maintain and repair, and to rent. Performance: Some we have a need for speed. Performance deals with the the maximum amount of travel distance with the least amount of effort in paddling. It’s also worth noting that performance is also highly influenced by the shape and design of the paddle board (racing paddle boards have significantly less width for greater glide than yoga paddle boards built with more deck space for yoga poses). PVC is short for polyvinyl chloride, a cheap and popular material used for most inflatable crafts, such as kayaks and air beds. PVC is durable and flexible. These paddle boards are similar to epoxy SUPs (more on this later), but are wrapped in a soft ethylene vinyl acetate (EVA) shell that makes the surface extremely elastic but tough, and use an acrylonitrile butadiene styrene (ABS) bottom for resistance to physical impact. Expanded polystyrene (EPS) foam is another lightweight alternative that is rigid and withstand concentrated load. These paddle boards are made with a fishbone framework that creates a hollow interior for buoyancy and strength. Then, typically either plywood or wood veneer is used to layer around the framework to create the rest of the board. They are then covered with resin to protect the wood. Wood-based boards are heavier to carry and cost more, but can last for many years and handle well in choppy water currents. Paddle boards made with resin use a mold to craft its shell. A vacuum draws resin into an air-tight sealed membrane mould where it hardens into the structure of a paddle board. There are several methods for creating a resin-based board, and each process has it’s strengths and weaknesses. The two popular resin-based paddle boards are fiberglass resin and epoxy resin. Which Material Paddle Board Is Right For You? Now that you have a better idea of the types of paddle boards available, it’s time to make a decision. 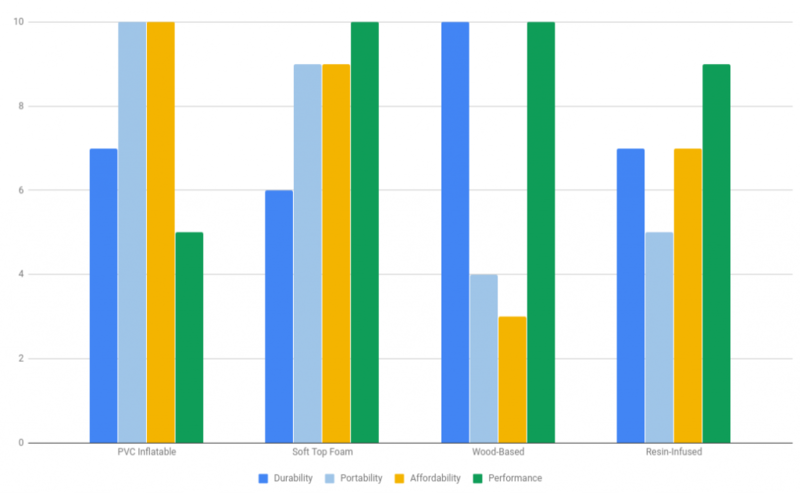 Here is a table of all our ratings on the criteria for each board material and how you can decide on which is best for you. If you have a budget you have in mind or want to spend the least amount for a good time, then PVC inflatables and soft top foams are the way to go. They are usually priced around a low $300 to a high $800, depending on accessories, board design (yoga, racing, all-around), and brand. For those interested in buying a paddle board that will last them a life time, wood-based and resin-infused paddle boards are the best choice. Well designed wood and resin-infused molded boards can last for years, while inflatables and soft top foams have a life span of 1 to 2 years depending on how frequent they are used. When you buy a paddle board for a specific activity (yoga, fishing, touring), then material might not matter as much. Although fishers, racers, and long distance touring paddlers might be interested in a reliable and durable board made of wood or resin-infusion, yoga enthusiasts and people buying for fun can get away with inflatable and soft top foam. There is a lot that goes into making a paddle board, including the main materials used. Each material has its advantages and disadvantages, and it’s up to you to decide what you are looking for and what you are willing to give up. In this guide, we look at the four main types of materials and how they are different compared to each other. We hope this guide helps you in understanding what paddle boards are made of!